I’ve always been curious about pawnshops as a business idea and with pawning as a source of credit for the public. When I look at rows of business establishments everywhere I went, I am amazed by the number of pawnshops I always seem to find. I used to wonder how these pawnshops can make a profit with competition all around. There’s just too many of them. In fact, the number of pawnshops in the Philippines has been steadily rising from year to year. 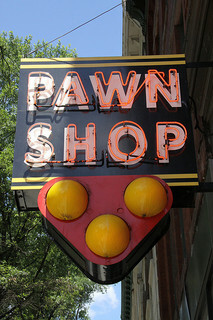 With just around 4000 pawnshops in 1995, it has grown to more than 16,000 this year (2012). That four-fold increase was reached with a yearly addition of approximately 700 pawnshops. It’s no wonder why pawnshops seem to be everywhere. To an entrepreneur, the business model of a pawnshop is indeed enticing. If you were a pawnshop business owner, you’re just basically lending money to anyone who can provide a personal item as collateral. Based on your own assessment of the item’s worth, you lend money to a customer. To lower the risk you’re taking in this transaction, the amount you lend is much less than the value of the collateral. When a borrower defaults, you won’t lose. You just sell the collateral you have in your possession to recover your cash. And since the loan amount is much less than the value of the item, the cash you’ll get will be much higher than what you loaned. You will, therefore, earn extra even in cases of defaults. The terms of the loans are also very favorable to the pawnshops. Interest rate of 4 to 5% monthly is charged to a loan for a minimum term of a month to six months. With this rate, pawnshops earn much more than banks or credit card companies. And unlike banks and other lending institutions, there’s no credit investigation required before a loan is approved. As long as the collateral is acceptable, even those with bad credit record can get a loan. Credit card companies have probably realized they’re losing this battle. These past few years, they have been loosening their requirements in order to gain more customers. Since credit card companies charge less for loans without the need for collateral, they’ve been taking away business from traditional pawnshops. This made pawnshops look at other opportunities besides pawning to augment their revenue. Many pawnshops now also act as remittance centers. Customers can pick-up the cash sent by their relatives working overseas from these pawnshops. If you’re thinking of setting up a pawnshop yourself, there are several regulatory requirements you’ll have to deal with. The Banko Sentral ng Pilipinas (BSP) is the government agency charged with regulating pawnshops in the Philippines. You’ll have to get their approval before you can operate on top of several other requirements from local governments and regulatory agencies. But the most important part is to meet the BSP requirement because they hold the key whether you’ll be allowed to go into the pawning business or not. Requirements set by the BSP include items such as minimum capital, compliance with the Anti-Money Laundering Act, employee hiring, etc. To know more about these requirements, you may want to contact the appropriate BSP personnel who can advise you on this. You may also check their website for the latest requirement list here. Next time I’ll write about pawning as a source of credit. Is it a good idea to pawn your valuables? What guidelines can you follow to make sure you don’t lose your property from pawning? Understanding how pawnshops work is a key to answering these questions that’s why I discussed it first. We’ll talk about pawnshops from the perspective of customers next. Stay tuned!